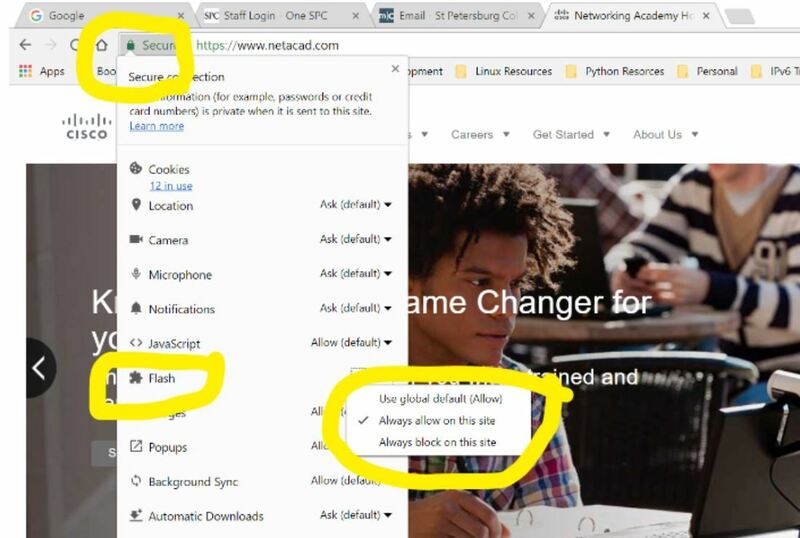 How to ensure Flash works properly in Chrome when accessing Netacad.com content: Occasionally, a student may complain that they are not able to answer all the questions in an end-of-chapter exam. This is most often due to issues with how Chrome handles the FLASH plugin. The following is an updated fix that will solve the issue if it’s related to FLASH. Start with a right-click on the lock icon immediately to the left of the site URL and then check the FLASH settings. Select “Use global default (Allow)” only if FLASH is shown as “allowed”, otherwise, use “always allow on this site” option. I suggest checking this on both the main netacad.com login screen and also after accessing the first exam. Use this space to post any questions you have about both the Cyber Innovation and the Cyber Security Challenges as we move through the year! I will moderate this blog for all cyber mentors, and answer any questions you have.